Gone are the days when matchmaking for marriages was the task of pundits or relatives or agents. In the contemporary scenario, online matchmaking has gained a lot of momentum. People now look for their ideal life partners on the different Matrimonial Websites catering to millions of people all across the world. With this trend, traditionally arranged marriages have become a pass. The young generation is trying to go beyond the traditional approaches when it comes to finding a worthy life partner. They trust the online websites for finding their ideal match more than the local matchmakers. Matrimonial Websites of India allow them to contact with their potential partners through email, chat or phone as against the conventional ways where the boy and girl were not allowed to interact with each other before the marriage. This helps in knowing the person well and developing an understanding before marriage, which can help in the post marriage life. Matrimonial India Portals provide plenty of choices to people for choosing the boy or girl of their choice. There are numbers of Indian matrimonial websites, some catering to a specific community, say for instance Gujarati and some to diverse communities, castes, religions etc. Moreover, on the Indian Matrimonial Websites, one can find a person belonging to a particular profession as well. For example, a doctor wishing to get married to only a doctor can search specifically for people belonging to this profession. Therefore, a large number of people are nowadays interested in creating their profiles on the Matrimonial India websites so that they are not limited to a particular region and get to know the most suitable person. So, those who are searching for a prospective life partner can start their search in the right direction by getting registered on Matrimonials India Websites. Absolutely agree with the points that have been made in this article. 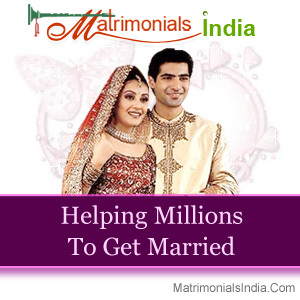 Indian matrimonial websites are performing the role of the traditional matchmaker. The websites do a much better job because they provide more choice spread over a larger geographical area than what a matchmaker can cover.